Is there really anything to learn from this irascible, reclusive genius and noble laureate ‘with a voice like sand and glue’? They say things come in threes. Or is it just that we look a little bit harder for patterns and connections after the coincidence of the first two things? Or maybe it is just a contrivance or two… (or three!) to introduce a blog topic? Either way three things have got me thinking about literature these past weeks. First, we had World Book Day – noted from a friends’ Facebook post and a piece on the radio. Second, courtesy of an e-newsletter from Aeon, this excellent article Storyhealing, in which Dr Gavin Francis muses eloquently and elegantly on the overlap between literature and medicine. Third, an equally excellent, and entertaining, lecture We need to talk about Robert by Simon Armitage, Professor of Poetry at Oxford University (and a personal hero of mine) which I attended. A podcast of the latter is on the site already hyperlinked – well worth a listen. The last two in particular were interesting in that they had a common cross-discipline element. In Storyhealing Francis explores the relationship between literature and medicine and finds contrasts, parallels and overlapping qualities. Armitage was doing the same – but in his case between poetry and music, taking as his start-point the award of the 2016 Nobel prize for literature to Bob Dylan. I found both pieces to be most illuminating and potentially applicable to my own bio-medical and healthcare endeavours. Astrocyte works hard to drive better cross-discipline collaboration and insert alternative perspectives to improve patient engagement across the healthcare and clinical research sector. I am also keen to look outside of science for insight and inspiration. Patient-centred care, patient and public involvement (PPI) and, pharma’s preferred catch-all phrase, patient centricity all reflect the much needed and well accepted philosophy of “No Decision About Me Without Me”. As noted in a previous blog however I believe each is ploughing a slightly different furrow and with slightly different aims. This is not an issue if there was no overlap, redundancy of effort or missed synergies – but I can’t help thinking that there are. Indeed, the more I explore this space the more I realise there are many groups working really hard to improve patient engagement and involvement. However, they are doing so in blissful ignorance of each other and, therefore, missing opportunities to cooperate, share, collaborate and ultimately use the energy and resources being expended in a more impactful and efficient way. Breaking down silos and driving cross-party awareness needs more than just a willingness to look across the divide and a receptivity to alternative viewpoints. It will only really happen if: firstly; there is an understanding and appreciation of each other’s existence and outputs, secondly; we find and acknowledge some common ground and shared objectives. Another challenge is finding a common language as many medical specialties are highly technical and somewhat opaque to the non-scientist and daunting to the lay person (not helped by physician’s insistence on using all the long words they learned in med school!). Furthermore, the old paternalistic, top-down system has worked reasonably well in medicine and consequently there is a lot of sclerosis, inertia and bias (conscious and subconscious) in the NHS, academia and the bio-pharma industry. This brings me back to the start point of this piece. Can literature, or more specifically the overlapping points of literature and medicine and/or literature and music, help us find a common language, or at least serve as a guide to begin to overcome the challenges. I believe they can. However, I also believe we need to be selective in the way in which we extrapolate such insights. In Storyhealing there are a number of helpful insights but I’d like to explore just one – that is the dilemma of empathy. Francis acknowledges how it is getting harder for Doctors to fully empathise with all their cases and patients as the emotional toll would be too high. Conversely the issue encapsulated in the quote below could create the impression that Doctors may be too dispassionate or, to use the word in the vernacular, too ‘clinical’ and therefore un-empathetic. At the heart of both physicians’ and writers’ work is a will to imagine and recognise the patterns of our lives, and ease its dissonances. But there’s a crucial difference: writers and readers have the liberty to lose themselves in their world of characters and plotlines, while clinicians must remain perceptive, attentive and, crucially, keep to time. Perhaps the non-medical advocates and patient groups driving the move to a more patient-centred dynamic need to better understand and acknowledge this dilemma. Such awareness could be the first building block in the move to a better common language and understanding of each other’s perspective. It could also help to offset and ease some of the resistance to change. I must admit I thought Francis may have mentioned ReLit a great initiative to directly and creatively exploit the written word in patient care. Like me, perhaps he did not have enough space in his piece to explore bibliotherapy (a future blog topic perhaps?). And so finally to our title, what can we learn from Bob Dylan? Well here I admit the insight is a bit looser – and I chose that word very deliberately. Armitage is, it seems to me, a little conflicted about Dylan’s Nobel prize. As a music lover and admirer of Dylan’s output (well some of it anyway) he appears to be genuinely chuffed for him. 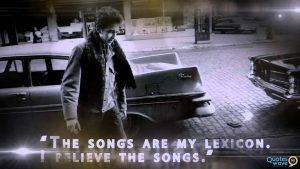 As a poet and a critic however he can see the flaws in Dylan’s lyrics and returns to the point that the prize is for literature. So how can this help us in the patient engagement world? Well I think the looseness of the conclusion is key (and is also reflected in the linguistic looseness in Dylan’s lyrics). It doesn’t really matter if it is technically great poetry – his work speaks to and illuminates the human condition. When we listen to one of his more thought-provoking songs the scan and the syntax are secondary to the message and memorability. Not fretting too much over correct grammar and, in our case, medical jargon can potentially help in any cross-discipline dialogue and mutual understanding. On the one hand, we need to acknowledge alternative perspectives and ways of describing them (take Martin Amis’ negative viewpoint on Dylan as a Nobel laureate or Joni Mitchell’s superior lyrics – both alluded to in Armitage’s lecture). On the other hand, provided we can reach common insight and understanding, a certain looseness of communication or language definition is OK too! So, patients don’t be daunted and HCPs don’t be threatened by the new patient-centred world which we are, baby-step by baby-step, moving towards. With the right attitude and an open mind (plus a few insights from outside healthcare) we can certainly find common ground, common goals and at least enough common language to give us mutual understanding and ultimately better outcomes for all stakeholders.